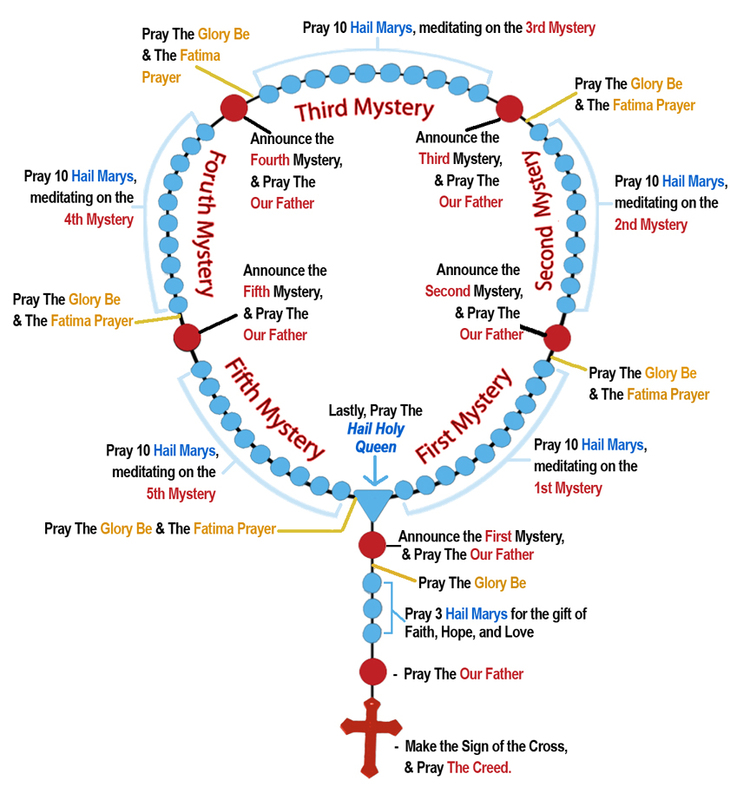 Taken from the website of Holy Trinity Catholic Church in Beaverton, OR (http://www.h-t.org/wp-content/uploads/2012/10/Rosary_Illustrated.jpg) Click the URL for a larger image. 1) Turn and face toward the east (Sicut enim fulgur exit ab oriente, et paret usque in occidentem: ita erit et adventus Filii hominis. Mt. xxiv, 27) , if at all possible, and kneel down. Make the Sign of the Cross (Signum Crucis). 3) Holding the Crucifix pray the Apostles Creed (Credo). 4) Move to the first bead and pray an Our Father (Pater Noster). 5) On each of the next three beads pray a Hail Mary (Ave Maria); offer the first Hail Mary for an increase in Faith, the second for an increase in Hope, and the third for an increase in Charity. 6) Move your fingers to the space between beads and pray the Glory Be (Gloria Patri). 7) Now it is time to begin meditating on the Mysteries. On the bead just before the medal announce the first Mystery, pray an Our Father, and begin to meditate on the Mystery. 9) After the last bead in the decade (set of ten beads) pray the Glory Be. 10) Pray the Fatima Prayer (Oratio Fatima). 11) Move to the second Mystery and decade and repeat steps 7-10, then the third Mystery and decade (again repeating steps 7-10), then the fourth Mystery and decade (again repeating steps 7-10), and finally the fifth Mystery and decade (once again repeating steps 7-10). 12) Touch your fingers to the medal where all three links in the chain converge and pray the Hail Holy Queen (Salve Regina). 13) Add whatever prayers seem suitable to you at the end. 14) Thank God and the Blessed Mother for the gift of the Rosary. 15) Make the Sign of the Cross. 16) An entirely optional but still entirely fitting conclusion in this day and time is the one that St. Paul used to finish off his First Letter to the Corinthians (1 Cor. 16: 22): Marana tha! Our Lord come. Veni Domine Iesu! I will offer to you first a Latin and then an English version of each of the Rosary prayers, and of as many other prayers as I can lay my hands on. It is my own opinion that the increased use of the Latin language by the Latin Rite of the Catholic Church will contribute mightily to the restoration of the lost Sees. So I ask anyone who has the ability or willingness to learn, and who wishes to commit themselves to this project, to utilize Latin as much as possible in the effort. Thank you. In Nomine Patris, Filii, et Spiritus Sancti. Amen. Credo in Deum Patrem omipotentem, Creatorem caeli et terrae. Et in Iesum Christum Filium eius unicum Dominum nostrum; qui conceptus est de Spiritu Sancto, natus ex Maria Virgine, passus sub Pontio Pilato, crucifixus, mortuus, et sepultus: descendit ad inferos; tertia die resurrexit a mortuis: ascendit ad coelos, sedet ad dexteram Dei Patris omnipotentis; inde venturus est iudicare vivos et mortuos. Credo in Spiritum Sanctum, sanctam Ecclesiam catholicam, Sanctorum communionem, remissionem peccatorum, carnis resurrectionem, vitam aeternam. Amen. I believe in God the Father Almighty, Creator of Heaven and Earth. And in Jesus Christ his only Son Our Lord; Who was conceived by the Holy Spirit, born of the Virgin Mary, suffered under Pontius Pilate, was crucified, died, and buried: He descended into Hell, the third day He rose again from the dead, He ascended into heaven, He is sitting at the right hand of God the Father Almighty; from there He shall come to judge the living and the dead. I believe in the Holy Spirit, the holy Catholic Church, the communion of Saints, the forgiveness of sins, the resurrection of the body, and life everlasting. Amen. Pater noster, qui es in caelis, sancificetur nomen tuum. Adveniat regnum tuum. Fiat voluntas tua, sicut in coelo et in terra. Panem nostrum quotidianum da nobis hodie. Et dimitte nobis debita nostra, sicut et nos dimittimus debitoribus nostris. Et ne nos inducas in tentationem: sed libera nos a malo. Amen. Our Father, Who art in heaven, hallowed be thy name. Thy kingdom come. Thy will be done on earth, as it is in heaven. Give us this day our daily bread. And forgive us our trespasses, as we forgive those that trespass against us. And lead us not into temptation, but deliver us from evil. Amen. Ave Maria, gratia plena, Dominus tecum; benedicta tu in mulieribus, et benedictus fructus ventris tui Iesus. Sancta Maria, Mater Dei, ora pro nobis peccatoribus nunc et in hora mortis nostrae. Amen. Hail Mary, full of grace, the Lord is with thee; blessed art thou among women and blessed is the fruit of thy womb Jesus. Holy Mary, Mother of God, pray for us sinners now and at the hour of our death. Amen. Gloria Patri, et Filio, et Spiritui Sancto. Sicut erat in principio et nunc et semper et in saecula saeculorum. Amen. O my Jesus, forgive us, save us from the fire of hell. Lead all souls to Heaven, especially those most in need. Salve Regina Mater misericordiae. Vita, dulcedo, et spes nostra, salve! Ad te clamamus, exsules filii Evae. Ad te suspiramus gementes et flentes in hac lacrymarum valle. Eia ergo, Advocata nostra, illos tuos misericordes oculos ad nos converte. Et Iesum, benedictum fructum ventris tui, nobis, post hoc exilium ostende. O clemens, o pia, o dulcis Virgo Maria. Ora pro nobis sancta Dei Genitrix. Ut digni efficiamur promissionibus Christi. Hail, holy Queen, Mother of mercy. Hail, our life, our sweetness, and our hope. To thee do we cry, poor banished children of Eve. To thee do we send up our sighs, mourning, and weeping in this vale of tears. Turn then, most gracious Advocate, thine eyes of mercy toward us. And after this our exile, show unto us the blessed Fruit of thy womb, Jesus. O clement, O loving, O sweet Virgin Mary. Pray for us, O holy Mother of God. That we may be made worthy of the promises of Christ. Aeterne rerum omnium effector Deus, memento abs te animas infidelium procreatas, easque ad imaginem et similitudinem tuam conditas. Memento Iesum, Filium tuum, pro illorum salute atrocissimam subisse necem. Noli, quaeso, Domine, ultra permittere ut Filius tuus ab infidelibus contemnatur, sed precibus sanctorum virorum et Ecclesiae, santissimi Filii tui sponsae, placatus, recordare misericordiae tuae et, oblitus idolitriae et infidelitatis eorum, effice ut ipsi quoque agnoscant aliquando quem misisti: Dominum Iesum Christum, qui est salus, vita et resurrectio nostra, per quem salvati et liberati sumus, cui sit gloria per infinita saecula saeculorum. Amen. O God, everlasting creator of all things, remember that the souls of unbelievers were made by Thee and formed in Thine own image and likeness. Remember that Jesus, Thy Son, endured a most bitter death for their salvation. Permit not, I beseech Thee, O Lord, that Thy Son should be despised any longer by unbelievers, but do Thou graciously accept the prayers of holy men and of the Church, the Spouse of Thy most holy Son, and be mindful of Thy mercy. Forget their idolatry and unbelief and grant that they too may some day know Him Thou hast sent: the Lord Jesus Christ, who is our Life and Resurrection, by whom we have been saved and delivered, to whom be glory for endless ages. Amen. Most Holy Trinity, Father, Son, and Holy Ghost. I offer You the most precious Body, Blood, Soul, and Divinity of Jesus Christ, present in all the tabernacles of the world, in reparation for the sacrileges, outrages, and indifference by which He Himself is offended. And through the infinite merits of His most Sacred Heart and the Immaculate Heart of Mary, I beg of you the conversion of poor sinners. Thank you Mike for the comment. I did that page several years ago before I had ever read anything about Fatima and I’ve never changed it. But on this count I think that we are both wrong: In Sister Lucia’a own book Fatima in Lucia’s own words she reports the Blessed Virgin telling the children at the conclusion of the July 13, 1917 Apparition: “When you pray the Rosary, say after each mystery: O my Jesus, forgive us, save us from the fire of hell. Lead all souls to heaven, especially those who are most in need.” I think I will change it to that now. Thanks for the reminder.